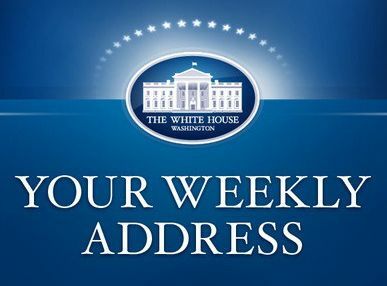 WASHINGTON, DC — In this week’s address, the President discussed the importance of ensuring that the economic progress we’ve made is shared by all hardworking Americans. Through his opportunity agenda, the President is focused on creating more jobs, educating more kids, and working to make sure hard work pays off with higher wages and better benefits. This week, the President will visit a community college in Los Angeles to highlight the need to equip our workers with the skills employers are looking for now and for the good jobs of the future, and he will continue looking for the best way to grow the economy and expand opportunity for more hardworking Americans. Hi, everybody. Over the past 52 months, our businesses have created nearly 10 million new jobs. The unemployment rate has fallen to its lowest point since 2008. Across lots of areas – energy, manufacturing, technology – our businesses and workers are leading again. In fact, for the first time in over a decade, business leaders worldwide have declared that China is no longer the world’s best place to invest – America is. None of this is an accident. It’s thanks to your resilience, resolve, and hard work that America has recovered faster and come farther than almost any other advanced country on Earth. Now we have the opportunity to ensure that this growth is broadly shared. Our economy grows best not from the top-down, but from the middle-out. We do better when the middle class does better. So we have to make sure that we’re not just creating more jobs, but raising middle-class wages and incomes. We have to make sure our economy works for every working American. My opportunity agenda does that. It’s built on creating more jobs, training more workers, educating all our kids, and making sure your hard work pays off with higher wages and better benefits. On Thursday, I traveled to Delaware to highlight how we’re trying to create more good, middle-class jobs rebuilding America: rebuilding roads and bridges, ports and airports, high-speed rail and internet. This week, Vice President Biden will release a report he’s been working on to reform our job training system into a job-driven training system. And I’ll visit a community college in L.A. that’s retraining workers for careers in the fast-growing health care sector. Because every worker deserves to know that if you lose your job, your country will help you train for an even better one. In recent days, both parties in Congress have taken some good steps in these areas. But we can do so much more for the middle class, and for folks working to join the middle class. We should raise the minimum wage so that no one who works full-time has to live in poverty. We should fight for fair pay and paid family leave. We should pass commonsense immigration reform that strengthens our borders and our businesses, and includes a chance for long-time residents to earn their citizenship. I want to work with Democrats and Republicans on all of these priorities. But I will do whatever I can, whenever I can, to help families like yours. Because nothing's more important to me than you -- your hopes, your concerns, and making sure this country remains the place where everyone who works hard can make it if you try. Thanks so much, and have a great weekend.